Used the external horn for the full day on Saturday, short matched T&P1, Multi Target, etc. All requiring timed sequences to simulate turning targets Outdoor range 20 firing points, reasonable wind blowing, all participants very satisfied with performance, could be heard easily along the line Was very pleased with performance. Useless! Not loud enough (in pair with a timer beep), requires a big and heavy external battery pack and a short cable. Make it radio controlled and 4 times as loud, and it will be much more usable! 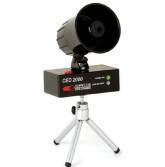 The CED2000 External Horn is ideal for use in any situation involving group participation, including shoot-offs, club, police, or military training. Perfect for “Man vs. Man” events. Designed for use with all CED7000 & CED8000 Timers, the CED2000 External Horn can also function independently as well. Loud Siren Horn (can easily be heard over 25 yards away with hearing protection on!